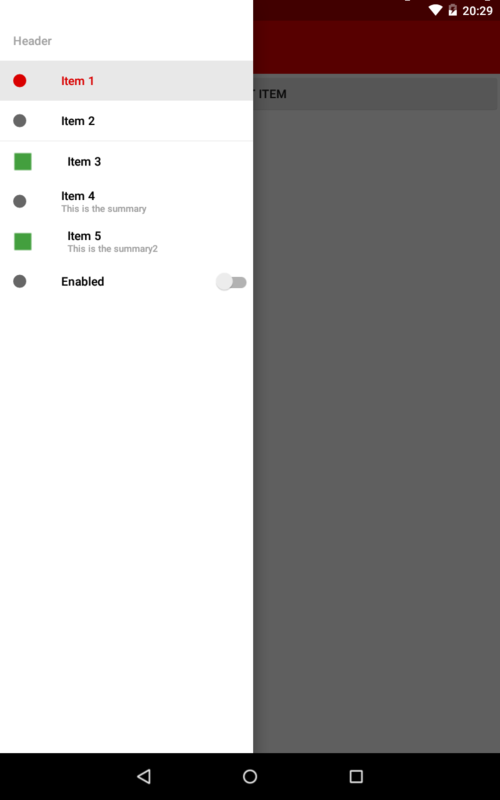 I am working on Android project and I am implementing the Navigation Drawer. I am reading through the new Material Design Spec and the Material Design Checklist. The spec says that the slide out pane should float above everything else including the status bar and be semi-transparent over the status bar. My navigation panel is over the status bar but its not got any transparency. I've followed the code from this SO post as suggested in the Google developers blog spot, link above How do I use DrawerLayout to display over the ActionBar/Toolbar and under the status bar?. Your status bar background is white, the background of your drawer LinearLayout. Why? You are settings fitsSystemWindows="true" for your DrawerLayout and the LinearLayout inside it. This causes your LinearLayout to expand behind the status bar (which is transparent). Thus, making the background for the drawer part of the status bar white. 2) You can remove fitsSystemWindows="true" from your LinearLayout. I think this is a more logical and cleaner approach. You will also avoid having a shadow being cast under the status bar, where your navigation drawer doesn't extend. If you want your drawer to extend behind the status bar and have a semi-transparent, status bar sized overlay, you can use a ScrimInsetFrameLayout as a container for your drawer content (ListView) and set the status bar background using app:insetForeground="#4000". Of course, you can change #4000 to anything you want. Don't forget to keep fitsSystemWindows="true" here! Or if you don't want to overlay your content and only display a solid color, you can just set the background of your LinearLayout to anything you want. Don't forget to set the background of your content separately though! EDIT: You no longer need to deal with any of this. Please see Design Support Library for a times easier Navigation Drawer/View implementation. Don't forget that the color (resource) must always be in the format of #AARRGGBB. This means that the color will also include the alpha value. Why not use something similar to this? The code above uses the alpha resource in the android:background to be able to show transparency within the actionbar. There are other ways to do this through code, as other answers show. My answer above, does the necessary in the xml layout file, which in my opinion is easily edited. You need to wrap your navigation drawer layout inside a ScrimLayout. A ScrimLayout basically draws a semi-transparent rectangle over your navigation drawer layout. To retrieve the size of the inset simply override fitSystemWindows in your ScrimLayout. Later override onDraw to draw a semi-transparent rectangle. An example implementation can be found in the Google IO App source. Here you can see how it's used in the layout xml. Now when you close the drawer you need to change status bar color again to dark.So you can do it in this way. * (status and navigation bars, overlay action bars). I had a similar feature to implement in my project. And to make my drawer transparent i just use the transparency for hex colours. Using 6 hex digits, you have 2 hex digits for each value of red, green and blue respectively. but if you put two additional digits (8 hex digits), so you have ARGB ( two digits for alpha value)(Look here). And here is another article that can help you understand the alpha codes in hex colors. Not the answer you're looking for? Browse other questions tagged android navigation-drawer android-5.0-lollipop material-design or ask your own question. Navigation Drawer Over Status Bar In Nougat? Material design drawer under the status bar: how to achieve it using a DrawerLayout with two FrameLayouts as children? Android - Change tint background color to navigation drawer?